You probably have noticed that: Visual Studio 2010 (VS2010) is about to be released. As of today, the Microsoft website states that VS2010 will be launched on April 12th. I have been playing with various builds since more than a year and I am really looking forward to taking this new version into production, since it comes loaded with plenty of new features for parallel programmers. After the launch you probably have to pay money for it, so grabbing the release candidate (RC) and taking a look at it right now may be worth it! 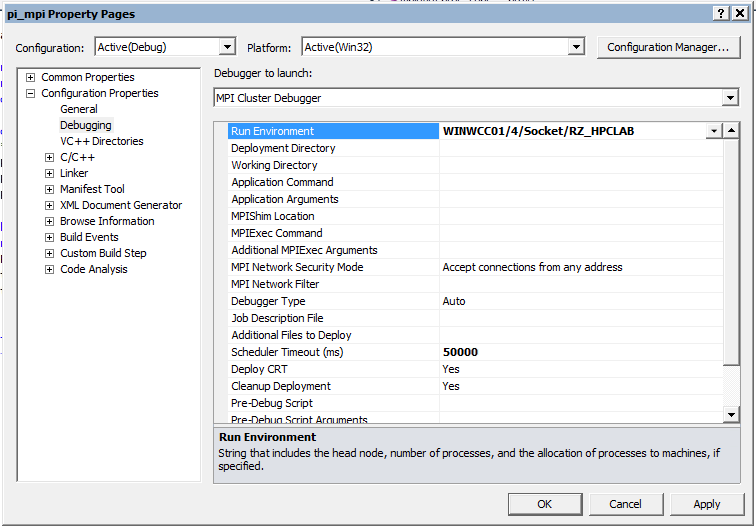 The feature I am talking about right now is the improved MPI Cluster Debugger that lets you execute MPI debugging jobs either locally or on a cluster, with only a minor configuration task involved. A few days ago at the German Windows-HPC User Group event Keith Yedlin from Microsoft Corp was talking about it and I demoed it live. Daniel Moth has a blog post providing an overview of that feature, MSDN has a walk-through on how to set it up, so I am not going to repeat all that content but instead explain how I am using it (and what I am still missing). Examining variable values across MPI processes. This is a core requirement on a parallel debugger, as I stated in previous posts already. 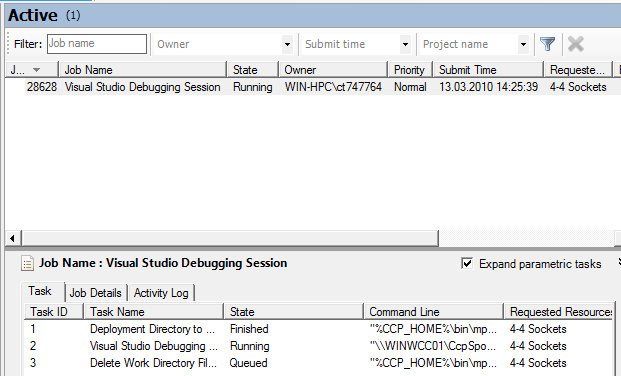 Visual Studio 2008 did allow for this already, but Visual Studio 2010 improved the way in which you inspect variables, especially if you are switching between threads and / or processes. I am not sure about the official name of the feature, but let me just call it laminate: when you put the mouse pointer over a variable the menu that will appear does not only show you the variable value, in VS2010 it also contains a sticker that you can click to keep this window persistent in front of the editor. In my debugging workflow I got used to laminate exactly those variables that have different values on the threads and / or processes involved in my program. Whenever I switch to a different thread and / or process that in fact has a different value for that particular variable, the view will become red. This turned out to be very handy! Debugging on a cluster is particularly useful if you program is not capable of being executed with a small number of processes, or if you have a large dataset to do the debugging with and not enough memory on the local machine. 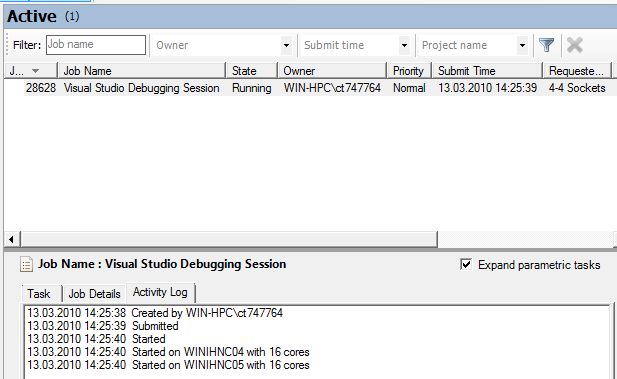 The debugging session is submitted to the cluster just like a regular compute job. Setting up your debugging project for the cluster is pretty simple: just select the head node of your cluster and then the necessary resources, that is all. Hint: After selecting the head node immediately select the node group (if any) to reduce the number of compute nodes status information are being queried from, since this may take a while and let the Node Selector dialog become unresponsive for some moments. As announced in a previous post already, I was involved in two workshops attached to the HPCS 2009, hosted by the HPCVL in Kinston, ON, Canada. Being back in the office now I found some time to upload my slide sets. Obviously I can only make my own slides public. Ruud van der Pas, Sun Microsystems; Dieter an Mey and Christian Terboven, RWTH Aachen University. Tasking in OpenMP 3.0 (Christian Terboven). Data Race Detection in OpenMP programs using the Sun Thread Analyzer (Christian Terboven). OpenMP in the Real World (Christian Terboven and Dieter an Mey). Christian Terboven, RWTH Aachen University. Windows HPC Server 2008: Overview (Christian Terboven). Windows HPC Server 2008: user’s point of view (Christian Terboven). Using Microsoft Visual Studio 2008 (Christian Terboven). 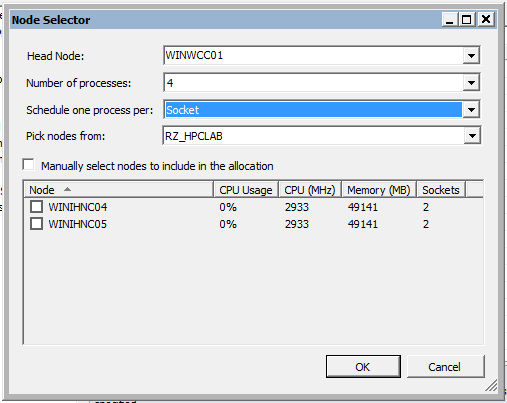 HPC Tools Portfolio: Shared-Memory Parallelization on Windows (Christian Terboven). HPC Tools Portfolio: Message-Passing with MPI on Windows (Christian Terboven). Case Studies … and an Outlook into the Future (Christian Terboven).